For more than 15 years, Pillitteri Estates has been dedicated to promoting Canadian Wines around the globe, leading the brand to become one of the world’s most widely recognized Canadian wine brands. C.E.O. and President Charlie Pillitteri, has spent years championing Canada’s flagship wine, Icewine, throughout the world. Since Pillitteri Estates released their first commercial Icewine in 1991, Mr. Pillitteri has made it his priority to strengthen Canada’s image abroad as a producer of high quality wines by exporting the virtues of Icewine. Our Export Sales Team makes frequent trips to our global distributors to participate in local market activities, consumer tastings, educational seminars and sales meetings. With a finger on the pulse of the global wine market, Pillitteri is able to offer unique and premium Canadian wines to enthusiasts across the world. We have a diverse portfolio and invite you to try some of the best wines that Canada has to offer. The Ontario Food Exporter Award recognizes an exporter’s successful expansion into new export markets, and their commitment to long-term export growth. The Award reflects the importance of exporting from Ontario’s Agri-food industry. A strong industry creates new jobs, new investment, and fosters economic growth in communities across the province. Ontario is Canada’s leader in food production and, as such, the Ontario Food Exporter Award recognizes outstanding exporters who contribute to that success. Pillitteri Estates Winery won the Ontario Food Exporter of the Year Award in 2013. The award was presented by the premier of Ontario Kathleen Whynne, who called Pillitteri Estates Winery “an industry leader”. This award recognizes Pillitteri Estates’ role in Ontario’s agricultural industry and its contribution to the local economy. Icewine is one of the world’s most rare and exotic wines, and Canada is proud to have perfected this beautiful product and introduced it to the world. Canadian Icewine is such a rare and unique product, that growing demand for it all over the world has been created. This rapid growth in demand, however, has created the opportunity for large amounts of counterfeit Canadian Icewine to enter the international market. Icewine is now one of the most counterfeited wines in the world. Pillitteri Estates, in keeping with their consistent role as an innovative industry leader, demanded more assurance to ensure customers were getting a quality product. Pillitteri Estates wanted to make sure that when customers purchase a bottle of Pillitteri Icewine they can be 100% confident that it is the authentic, high-quality product they have come to expect from Pillitteri Estates. This is why Pillitteri Estates is taking extreme security measures in order to protect their name and their product. Pillitteri Estates Winery proudly introduced Bubble Seal™ technology. Bubble Seal™ is the highest level of security technology in use to ensure the authenticity of Pillitteri Estate’s Icewines. 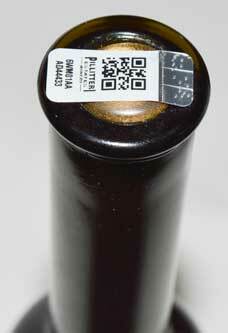 Bubble Seal™ is a silver label that is applied along the top of the bottle over the cork. Each Bubble Seal™ has a unique pattern of bubbles called the Bubble Tag™. This pattern of bubbles is self-generated during production and is statistically impossible to reproduce in any way. After production, an image of the Bubble Tag™ is stored in an online database which consumers can access online at www.prooftag.com by entering in the reference number on the Bubble Seal™, or via smartphone by flashing the Datamatrix of the Bubble Seal™. The linked page for each Bubble Seal™ displays the recorded image of the specific Bubble Tag™ so the consumer can make a visual comparison on the spot, as well as information about the product and producer. Consumers can get their quality guarantee on the spot directly from Pillitteri Estates.